Can a person live on Rs 139 per day? Are only 843,913 people in poverty? Can the Official Poverty Line (OPL) be believable? Why is the Governments trying to hide the country’s poverty? The latest Report issued by the Ministry of National Policies and Economic Affairs on ‘Poverty Indicators’ is both questionable and outrageous.1This Ministry is under the responsibility of the Prime Minister, Ranil Wickremesinghe. Most of the statistics and calculations are based on the Household Income and Expenditure Survey (HIES) in 2016. It is not so much the Survey HIES which is questionable, but the Government’s Official Poverty Line (OPL) and some of the calculations and statements in the Report based on that. There are different ways of conceptualizing and calculating poverty. Amartya Sen in his ‘Poverty and Famines: An Essay on Entitlement and Deprivation’ (1983) has devoted two chapters on the subject. Most common measurement of poverty is by looking at the number of people living below a certain income threshold known as ‘poverty line.’ Then there are differences about how you determine this threshold. This is the primary question about the OPL used by Sri Lanka since 2002. On the method of determining this threshold, the following is what the Poverty Indicators Report states. The claim that ‘absolute poverty line does not vary geographically’ contradicts the regular Department of Census and Statistics charts given in Official Poverty Line by District, the latest being on 7 January.2 Be as it may, can anyone believe that ‘the real per capita expenditure per month a person needs for a specific welfare level with the consumption expenditure of food and non-food items’ is Rs. 4,166? When you divide this by at least 30 days per month, it is mere Rs. 139! Despite the confusion about ‘kilocalories, nutrition, food and non-food consumption’of the poor, there is nothing particularly wrong in calculating an absolute poverty line although some countries (i.e. Australia) use relative poverty line. However, the way you arrive at this measure should be correct, reasonable and also transparent (under good governance). As the above statement makes it clear it is determined on the basis of a minimum ‘nutritional’ intake. This minimum is stated as 2030 kilocalories per day, which is in fact similar to the standard accepted in a country like Australiaor USA. The question about the method is what is the ‘food bundle’ selected for this nutrition calculation and on what scientific basis can it be said correct? The ‘food bundle’ is not revealed. However, the doubts arise when the given figures are considered in the day today living reality. During my last visit to Sri Lanka (July-August 2018), the cheapest rice meal (bath packet) I could observe was Rs. 160 which consisted rice with three little vegetables at Ratmalana where I was staying. It could hardly give anyone 500 kilocalories in my opinion (rice 300 + vegetables 200). Calories also do not necessarily mean nutrition for basic and sickness-free living. The obvious discrepancy between the price of a basic one meal (roughly Rs. 160) and the government’s absurd poverty line (Rs. 139) might be the case not only in the Western Province or Ratmalana,but in all other Provinces with little variation. The statistics given in the Report are not really about poverty, but may be extreme-extreme poverty. Therefore, there is nothing to be jubilant about as the Report tries to picture. According to the controversial Report itself, there are 843,913 people below this extreme poverty line, who might not be in a position to afford even one meal a day. That is why I call it the extreme of the extreme poverty. Then how do they live? They are not supported by the state or the government. They are probably supported by family, neighbours, temples/kovils and the society at large. Some might be mere beggars. Some of the figures are the following of this extreme poverty, if we consider the other calculations are not faulty except the bottom line of OPL. 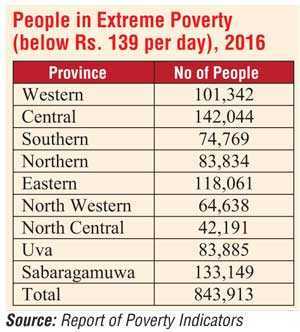 As the above figures show, the highest number of people in extreme poverty are in the Central, Sabaragamuwa, Eastern and Western provinces. However in terms of headcounts (% of provincial population), Northern, Eastern, Sabaragamuwa and Uva provinces are the most affected. The Report claims “The poverty headcount index for 2016 was 4.1 and it has decreased from 6.7 in 2012/13.” This is obviously a miracle. This might be the lowest poverty in the world for a developing country. As I had pointed out before, this was the same claim under the previous government. There was a (economics) Minister who claimed that ‘a family of three could live a comfortable life with an income of Rs. 7,500 per month’ (Daily Mirror, 19 March 2012). This means Rs. 83 per person per day in 2012! It is difficult to believe that a country with slow growth during the same period could eliminate poverty by half a million within three years (2013-2016). Therefore, common sense should have prevailed before issuing the Report and the officials and the Minister should have checked where they were going wrong. There are wonderful or deceptive Figures and Tables given in the Report. Most absurd to my mind is Table 2 which calculates the so-called Poverty Gap Index (PGI), to show the monthly ‘shortfall of income’ that one has to overcome the poverty in Sri Lanka! This is just Rs. 620 as an average! This means if you are in poverty (eating possibly one meal as I have pointed out), you need only Rs. 620 per month or Rs. 20 per day to overcome the Official Poverty. These figures are calculated for sectors (urban, rural and estate), provinces and districts. For example, if you are a poor in Hambantota, you need only Rs. 396 per month or Rs. 13 per day to overcome poverty. It is like saying, all those who are under the OPL (Rs. 139 per day) should study carefully this table and take measures to overcome their poverty. Therefore, by the next report, the poverty in Sri Lanka might be totally eliminated! Most hilarious or outrageous in the Report is the two quotes given one from Norman Vincent Peale and the other from Adam Smith as follows. From the second quote, it says ‘the real tragedy of the poor is their poverty of aspirations,’ which may be partly true. However it is given out of context. It is difficult to imagine whether the authors of the Report are familiar with Adam Smith’s ‘The Wealth of Nations’ (1776) at all. Whatever the disagreements one has about Adam Smith’s economic philosophy, to be fair, he was never a person who intended to insult the poor like our neo-liberals do in the Report. Counting poverty or devising necessary measures to do so is not an easy task and errors can happen. However, using completely an outdated, unscientific and obviously erroneous Official Poverty Line (OPL) and submitting reports to the country on that basis is outrageous. It is equally absurd to claim that the OPL is calculated on the basis of Cost of Basic Needs. What are basic needs? A traditional list of basic needs include food (safe water), shelter and clothing. Many modern lists emphasize not just those but also sanitation, education, healthcare and even internet (Wikipedia). If a person is not in a position to afford sanitation, health care or his or her children’s education, undoubtedly that person is in poverty. There is no question that the country has achieved some economic progress and development irrespective of the country’s setbacks during the open conflict and war period. There is a possibility that the income/expenditure position of the bottom 10% of the population has moved slightly upwards, but largely in monetary terms. However who has benefitted most from the economic policies of the present and the past governments are the top 10% and the middle layers. As the Report itself admits there is a large number of people just above the OPL. Likewise, the claimed decrease of the poverty headcount from 6.7% to 4.1% between 2012/13 and 2016 can be due to this monetary changes. In essence, the present OPL is completely undervalued or underestimated. If it is increased by 10% for example, the extreme poverty in Sri Lanka might remain more or less the same as in 2012/13. Sri Lanka’s OPL’s has been well below the poverty line used by the World Bank even before 2015 when it was changed. Now it is roughly $ 2 per day. What does this mean? Those who have an income below Rs. 364 per day or Rs. 10,920 per month would be in poverty. 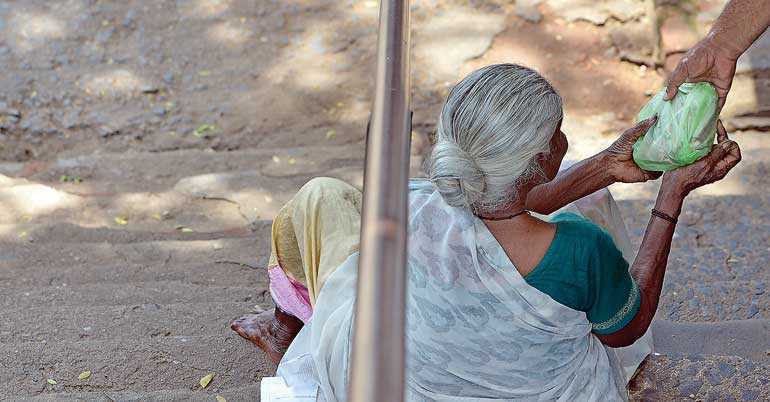 Sri Lanka should adopt either the World Bank criteria or in my opinion should go for a more progressive ‘relative poverty line’ like in Australia.